What can a creature’s eyes tell us? How about where it ranks on the evolutionary scale? Until recently the hagfish was seen as a living example of an intermediate form in the stepwise evolution of eyes. Its blind eyes1 with sightless retinas lack image-forming essentials like a lens, iris, and melanin2 pigment3 as well as muscles for eye movement. The eyes can even be buried beneath its skin!4 The hagfish was therefore thought to have less evolved eyes than its creepy cousin the lamprey,5 which has a sophisticated camera-type eye. Together these jawless fish were thought to speak volumes about the evolutionary history of the vertebrate eye. Now in light of new discoveries in the fossil record, evolutionists must abandon the hagfish as the last living candidate for an intermediate, evolutionary form of eyes. Why? Because careful study of fossilized hagfish reveals hagfish once had nicely developed eyes! Evolutionists must regroup and imagine that hagfish and lampreys shared an even more ancient eyeless ancestor for which there is no living or fossil evidence at all. Thanks to the vision of ancient hagfish, what evolutionists once thought they could demonstrate using hagfish blindness has changed in the proverbial blink of an eye. The hagfish is a jawless fish. Modern hagfish are blind, and their eyes are missing so many parts that they hardly qualify as eyes. But ancient hagfish, scientists recently learned, had complex eyes like a lamprey’s. This discovery means that hagfish can no longer be used as an example of an intermediate evolutionary step in eye evolution. Image by Pbsouthwood, via Wikimedia Commons. Lampreys, like hagfish, are jawless, cartilaginous fish. Despite their eel-like look, they are not eels. 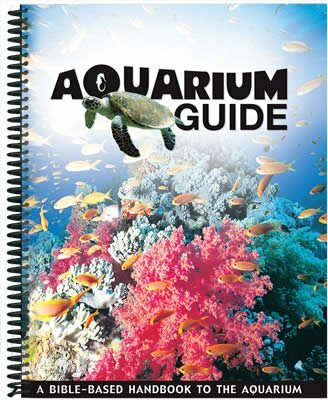 (Eels have bones and jaws.) Unlike the hagfish, the lamprey, like humans and the majority of animal species, has a complex camera-type eye. Image by Nicke L, via Wikimedia Commons. Until now, that is. This new evidence from the fossil record has, in reality, set back evolutionary claims even further, for the ancient hagfish’s eyes are anything but primitively simple structures. Gabbott and her colleagues used scanning electron microscopy to take a closer look at nine fossil lampreys, Mayomyzon pieckoensis, and the only known fossilized hagfish, Myxinikela siroka. These museum specimens came from the Mazon Creek Lagerstätte, Late-Carboniferous shale believed by evolutionists to be 307 million years old. They confirmed that the pair of dark dots in the place where eyes should be really are eyes, even on the hagfish. Key anatomical landmarks match those on modern lamprey eyes, with the dark round inner ear, located behind the eyes, even being preserved on some of the lamprey specimens.12 And even though modern hagfish do not exhibit eye complexity, the details in the dark dots on the fossilized hagfish match those in the fossil lampreys’ complex eyes. So what happened to the hagfish’s eyes? Like blind cave fish, the modern hagfish has either lost the information for producing eyes or stopped expressing that information. Is that evolution or “devolution” or reverse evolution? Not at all. No one has shown that the information to make eyes in the first place was acquired through random natural processes, so the process of evolution has not been reversed. Neither is the loss of information or the end of its expression the same as acquiring new information. 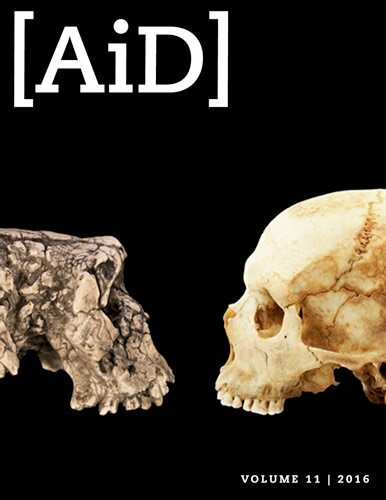 Have Evolutionists Conceded on Eye Evolution? Based on the evidence from the hagfish fossil, there was nothing primitively simple about the ancient hagfish eye. Fossil evidence indicates the ancient hagfish eye was not a transitional form. Having lost their only supposed intermediate form of the vertebrate eye, have evolutionists given up their model? Of course not. They still assume that the vertebrate eye evolved through a series of steps but presume that the fossil evidence for this bit of visual history remains undiscovered, deeper in history and perhaps lost to the ravages of time and chance. Fossil evidence indicates the ancient hagfish eye was not a transitional form. Creationists have long pointed out the lack of fossil evidence for eye evolution. Gabbott admits as much, saying, “Sight is perhaps our most cherished sense but its evolution in vertebrates is enigmatic and a cause célèbre for creationists.”17 And even though she claims, “We bring new fossil evidence to bear on an iconic evolutionary problem: the early evolution of the vertebrate eye,”18 her discovery adds nothing to the evolutionary story, demonstrating only that the commonly held evolutionary story of the eye is without merit. Why, some might ask, do evolutionists hang onto their story when the evidence does not support it? Well, it comes down to worldview. No scientist was around to observe the origin of eyes. And even if the fossil record contained a series of extinct vertebrate eyes that could be arranged from primitive to complex—and evolutionists concede it does not—those would represent only a collection of animals with different sorts of eyes. Only the evolutionary imagination—the belief that the existence of complex eyes means they must have evolved through a series of natural processes—connects the dots between such fossils. If a person already assumes the only acceptable explanation is an evolutionary one, then he or she is predisposed to fill in unobservable details about origins with unverifiable evolutionary processes. If a person understands that the only eyewitness to the origin of eyes is the Creator God of the Bible, then he or she is able to see that the observable evidence relevant to this visual history fits the biblical account perfectly. According to Genesis, during the last few days of the creation week about 6,000 years ago, God created all the animal kinds as well as the first two people, fully formed and functional without any time for evolution’s natural processes. The kinds of fish God created on the fifth day of that week ( Genesis 1:20–23 ) were designed to reproduce after their kinds. Biological observations affirm that animals (and humans) only reproduce and vary within their created kinds, being unable to acquire the information to evolve into new more complex kinds of creatures through natural processes. Once a person understands that the most reliable source of information about our distant past is the Word of the all-knowing God who created us and saw it all unfold, the existence of the blind hagfish makes sense. The loss of genetic information, or the cessation of its expression as is seen in blind cavefish (see “How Cavefish Went Blind, and Why It Matters”), is not evolution but only the sort of loss that occurs in a world fraught with deterioration and degeneration since man’s sin introduced death into the perfect world God made. Once a person understands that the most reliable source of information about our distant past is the Word of the all-knowing God who created us and saw it all unfold, the existence of the blind hagfish makes sense. The rather grisly behavior of the hagfish indicates it could be the poster child not for eye evolution but for the sorts of predatory behaviors that have developed in our sin-cursed world. In addition to scavenging in ways we may find repugnant,24 hagfish are also predatory. They have even been observed purposefully suffocating gill-breathing fish with their slime and carrying them off for a private feast.25 Thus when we look at the modern hagfish not staring back at us, we should not see evidence of evolution as Gabbott suggests (despite her discovery to the contrary), but we should see an example of a well-designed animal that has degenerated since God created it about 6,000 years ago, joining in the world of death that has reigned since Adam’s rebellion against our Creator. Does the Diversity of Eyes in Nature Support Evolution? Some living hagfish have light-detecting, pigmented eyespots, but they do not have the equipment to resolve images. Melanin pigment serves important functions in sighted eyes, including the capture of light and, as an antioxidant, protection of delicate tissues from toxic by-products of the retina’s high metabolic rate. Living hagfish actually do have some retinal pigment, but not melanin. Both hagfish and lampreys have melanopsin in their retinal epithelium. Melanopsin serves only non-image-forming light-detecting roles in people, but it is thought to serve image-forming functions in some animals, possibly including the lamprey, which does have complex functional eyes. Melanopsin is encoded by only a single gene in both the hagfish and the lamprey, but that gene is expressed differently. Hagfish melanopsin is primarily found in only one sort of cell in the hagfish retina but in two sorts of retinal cells in the lamprey. Because the modern hagfish’s eye is not equipped to focus an image on its retina, its melanopsin can now serve it only as a light-dark detector. From Lanfang Sun et al., “Distribution of Mammalian-Like Melanopsin in Cyclostome Retinas Exhibiting a Different Extent of Visual Functions,” PLOS One 9, no. 9 (2014): doi:10.1371/journal.pone.0108209. Sarah Gabbott et al., “Pigmented Anatomy in Carboniferous Cyclostomes and the Evolution of the Vertebrate Eye,” Proceedings of the Royal Society B 283, no. 1836 (2016): 1, doi:10.1098/rspb.2016.1151. Gabbott et al., “Pigmented Anatomy in Carboniferous Cyclostomes and the Evolution of the Vertebrate Eye,” 1. 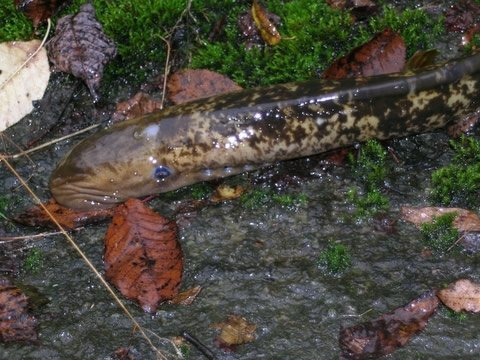 University of Leicester, “New Light Shed on How Vertebrates See: Details in Eyes of 300-Million-Year-Old Lamprey and Hagfish Fossils,” Science Daily, August 2, 2016, https://www.sciencedaily.com/releases/2016/08/160802222253.htm. Gabbott et al., “Pigmented Anatomy in Carboniferous Cyclostomes and the Evolution of the Vertebrate Eye,” 6. Hannah Waters, “14 Fun Facts About Hagfish,” Smithsonian, October 17, 2012, http://www.smithsonianmag.com/science-nature/14-fun-facts-about-hagfish-77165589/?no-ist. 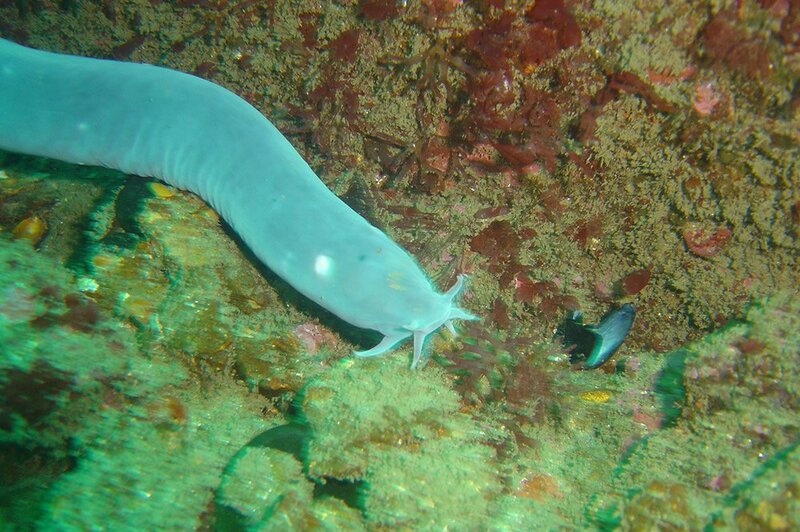 Vincent Zintzen et al., “Hagfish Predatory Behavior and Slime Defence Mechanism,” Scientific Reports 1, no. 131 (2011): doi:10.1038/srep00131. As discussed by hagfish expert Dr. Douglas Fudge, associate professor of integrative biology, University of Guelph, in “Fun with Silly String & Hagfish” at http://comparativephys.ca/fudgelab/. John Bocskay, “The Good, the Bad, and the Hagfish,” Sweet Pickles and Corn, https://sweetpicklesandcorn.wordpress.com/2014/10/05/the-good-the-bad-and-the-hagfish/.